The Crown Prince of Bahrain has said he will not attend Prince William and Kate Middleton's wedding on Friday because of ongoing unrest in the Gulf kingdom. Prince Salman bin Hamad Al-Khalifa said it was with "deep regret" that he had reached his "considered decision". He said he had hoped the situation in Bahrain would have improved so he could attend and not "overshadow" the event. Human rights campaigners had petitioned against his attendance because of his government's treatment of protesters. Bahrain, a normally placid Arabian island nation, has been the focus of ongoing violent clashes between anti-government demonstrators and security forces. Scores of people have been killed and the government has announced a state of emergency, calling in Saudi troops to keep order. The recent clashes began in February after police fired on protesters, killing seven people. The Crown Prince wrote to the Prince of Wales to explain his decision, expressing his "wholehearted apologies". He also said he was "saddened and troubled" by media reports about his attendance referring to the bloodshed in his country and his government's treatment of the mainly Shia pro-democracy protesters. He said: "While these [media reports] have certainly highlighted a number of significant issues currently facing the Kingdom of Bahrain, they have fundamentally misrepresented my own views, outlook and position on recent events." He added that they had "clearly sought to involve my potential attendance as a political proxy for wider matters involving Bahrain". The BBC's royal correspondent Peter Hunt said just 24 hours ago the prince was definitely coming, and added "who knows what sort of diplomatic pressure might have been applied behind the scenes?". He said while Prince William's officials were saying nothing in public, they would be privately pleased that one "distraction" had gone away. Human rights campaigner Peter Tatchell was amongst those who criticised the inclusion of the prince, and others, on the wedding list which was made public on Saturday. He said: "The invitations are a massive misjudgement by the monarch. They show the Queen is out of touch with the humanitarian values of modern, liberal Britain. She's putting royalty before human rights. "The guest list displays a shocking insensitivity to the suffering of people who have been persecuted." 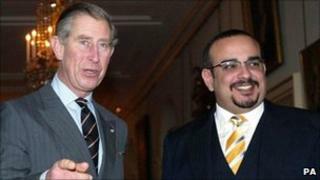 Clarence House said it was informed on Sunday morning that the prince would no long be attending, and the Bahraini royal family would not be sending a representative.